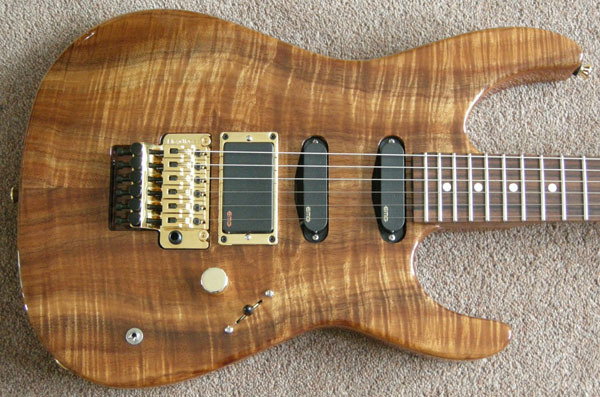 I have known Rich at Stormshadow for a while now (after many a guiatr set up) and after discussing various options at length, I finally pulled the trigger and ordered the beast of a guitar that you see in the picture. I have wanted this guitar for so long. When I saw the finished guitar for the first time I could hardly believe what I was looking at. The pictures just do not do the top or the finish justice. It kinda has a 3D look to it when you hold it in the light. Its jaw dropping and probably the best natrual wood finish to a guitar I have ever seen...and its mine! Rich has managed to follow the same neck feel of my Reb so I have two guitars that play and feel very similar. Due to having the same pickups and electronics, it also sounds similar to the Reb, but ...well, better. It plays like butter and I already feel so comfortable with it. I unleashed it a feww weeks ago at my bands 20th Anniversary party gig and I kid you not, tons of folk commented on what a spectacular looking instrument I was holding. Some even had their picture taken whilst holding it. A few of our regular fans also commented about a better guitar tone that I was getting. The build quality is right up there with any of the big names you care to throw into the mix. Frankly, you can take your Suhrs, your Andersons PRS and Tylers (I have played them all) and place them where the sun may not shine so brightly. To have a local luthier who listens to what you want and who can produce exactly what you want....kinda on my doorstep, is amazing. Hats of to Ted...er...Rich on a quite simply stunning, stunning instrument. You might be reading this review thinking, "well, hes bound to give it a good reivew as its his" and youre damn right. I would also challenge anyone not to give it a great review - its that good. For anyone who wants a one off custom guitar built at a reasonable cost - Rich is your man and I would urge anyone to give him a try. "Besides being a super cool guy to do business with, Rich at Stormshadow built my dream guitar for me, exactly to my specifications using the best woods and materials available. His approach to the project was one of absolute collaboration and his attention to detail in the construction was without question. To say I was bowled over when I finally saw the finished article is an understatement. It is such a comfortable instrument to play and the range of tunes that I require are right there in the choice of pickups. I can go from super clean to tear your face off power easily. My biggest dilemma now is that I want another one...."